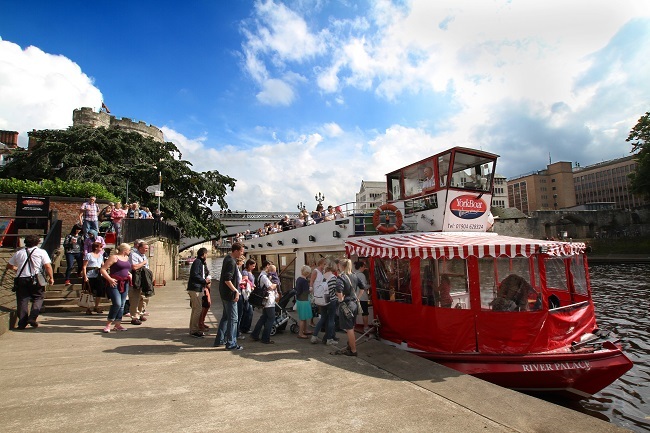 Let us guide you through our beautiful city of York on one of 3 sightseeing trips, York City Cruise, Early Evening Cruise and Floodlit Evening Cruise. Pre-booking your group ensures you benefit from having seats reserved and guaranteed places. Group bookings are available for 20 – 100 people. For peace of mind, special group rates and a unique view of York, call now to book. 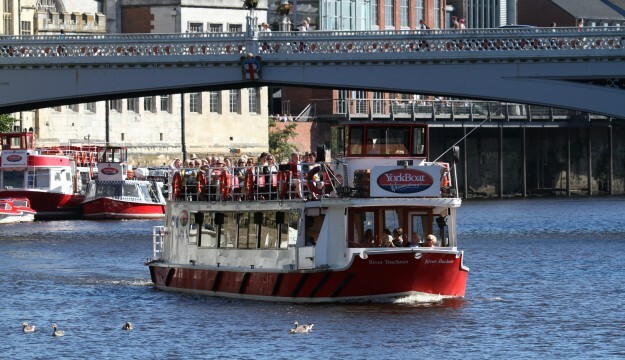 Our 45 minute York City Cruise is the perfect way to unwind and take in the sights. With live captain’s commentary, it is a great way to see York in the comfort of a heated saloon or open top deck. Our boats are equipped with fully stocked bars and toilet facilities.Award finalist for ‘Outstanding Customer Service’, our team will take great care of you from boarding to disembarking. We have four guaranteed sailings at 10.30am, 12pm, 1.30pm and 3pm from February to November 2016. Extra cruises depart between May and October, every 30 minutes from 10.30am to 3pm. After a busy day in York, put your feet up on a 60 minute Early Evening Cruise. Admire the sights of York’s riverside by twilight and enjoy a drink from the bar. With live captain’s commentary, this cruise is suitable for the whole family. Departing at 7.30pm and returning for 8.30pm. Kings Staith Landing, York. Our landing is in the centre of York, just in front of the Kings Arms pub near Ouse Bridge. Finish your evening in style onboard this 70 minute floodlit tour. Relax whilst you enjoy a mixture of background music and live captain’s commentary. Treat yourself to a drink from the bar and rest your feet. Departing at 9.15pm and returning for 10.25pm.